Rugged enough for both on- and off-the road vehicles, this 3-inch gauge communicates directly with the J1939 CAN data bus. In addition to a needle driven readout, it features an alphanumeric display for additional information. Like other VIS gauges, it can be configured for a wide variety of readouts, even custom readouts. AMETEK VIS' C-COM 3AD CAN-Communicator is a highly versatile stand alone gauge that can satisfy the instrumentation requirements for all vehicle platforms. The C-COM 3AD is a direct J1939 CAN gauge designed to also accept a pulsed speed input or a NMEA-0183 GPS receiver on the USB input. The backlit, 13 segment, 7-digit alphanumeric LCD displays vehicle information, such as odometer, hourmeter, coolant temperature and vehicle speed. With the optional external buttons, the menu system expands to also include additional vehicle data, two resettable trip mileage and hours, diagnostic fault codes and warning messages. As a GPS speedometer, the C-COM 3AD can provide road speed for vehicles without wheel or drive train sensors. Two optional dead-fronted LED telltale indicators can be customized per application. The LEDs can be controlled by switched inputs or J1939 data bus. The gauge is sealed to IP67 specifications both front and rear. The gauge operates from 9 to 32 volts DC and includes multi-option inputs that can be used for resistive, analog, pulsed speed or USB inputs. 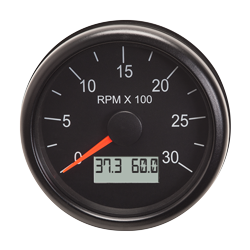 Designed to withstand harsh conditions typical of off-road environments, the 2-inch display gauge meets all SAE J1455 and J1113 requirements for vehicular instrumentation.